Grab your wallet and thick-rimmed glasses, the Pittsburgh Vintage Mixer is twisting into Lawrenceville this weekend. The mixer, the second of the year following May’s event at the Heinz History Center, brings vintage lovers to the Teamster Temple in Lawerenceville and draws Rust Belt antique vendors from across the state to showcase their collections and advertise their businesses. The weekend will begin with a Night Owl pre-sale event Friday night with live music, crafting stations and all 30 vendors. The mixer continues Saturday at 9 a.m. and ends at 3 p.m.
Pittsburgh’s own drag queen Alora Chateaux will emcee the night, which includes a performance from local pop band The Gothees. The preparty will also include a photobooth selfie station and giveaways from the Carnegie Museum of Art, which is sponsoring the event. Greenfield resident Abby Woods, 22, who has attended many of the Mixers in years past, said that it allows her to meet like-minded people with a common interest in collecting antiques. “Not only do I get to support local businesses, but I also get to take a peek at some really great pieces that only the finest collectors and curates will have,” she said. Her favorite find at the Mixer is a poster of “The Mysterians” movie from 1957, which inspired one of her favorite bands of the same name, from the ‘60s. Vendors range from online collectors to brick-and-mortar store owners that hail from as close as South Side to as far away as Erie. The mixer debuted in 2012 at the New Hazlett Theater in the North Side. 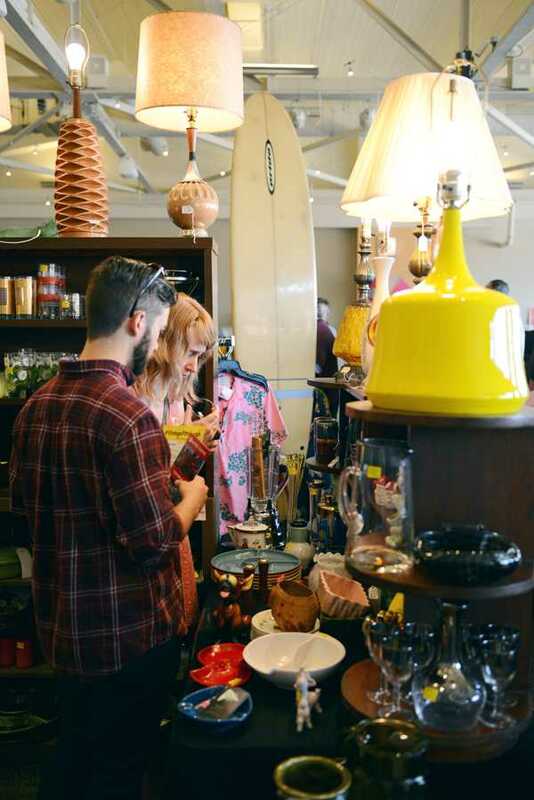 The mixer is a platform where small businesses can “come together and sell their wares while connecting with vintage collectors,” said Dunlevy. In order to participate, vendors must apply to secure a spot. Organizers of this year’s mixer, Dunlevy, Jason Sumney and Michael Lutz, then sift through every application and select a diverse mix of Rust Belt antiques. Kate Colussy, owner of Pittsburgh-based Highway Robbery Vintage, has participated in the mixer since 2011, bringing clothing pieces from the ’50s through the ’90s from her South Side storefront. “It’s good to talk to people that wouldn’t otherwise have come to the South Side,” Colussy said, who plans to unveil “a little mix of what I think is the best of the store” at her stand this Friday and Saturday.